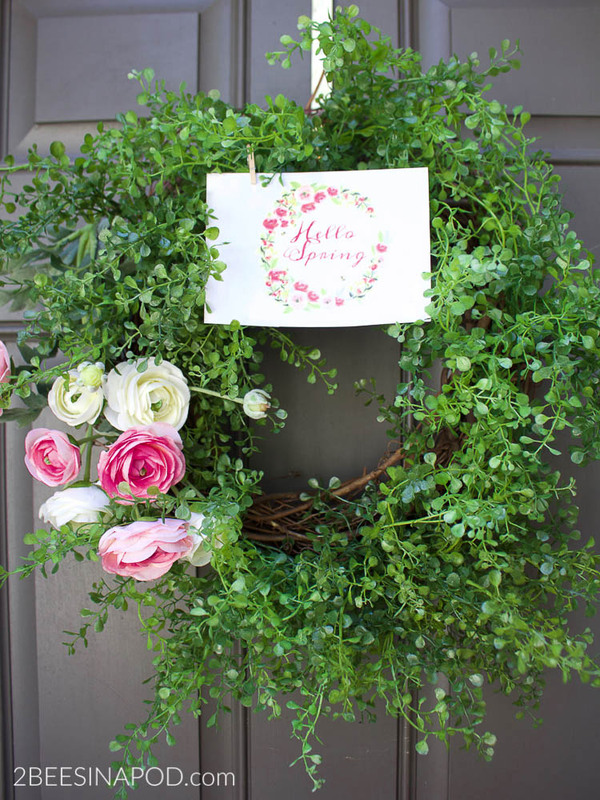 When spring approaches, the first decor item that we put up is a wreath on the front door. 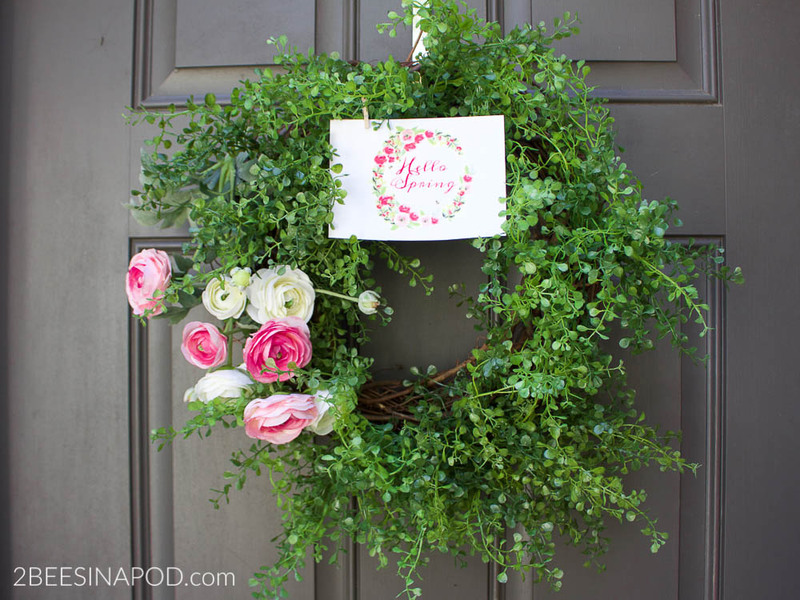 We created a new spring ranunculus wreath and matching printable. 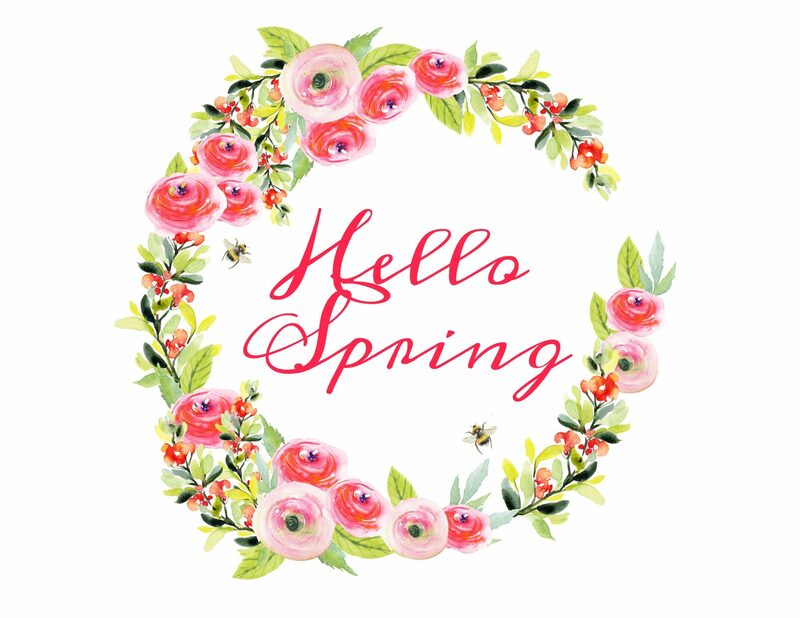 Are you doing any spring decorating in your home? Slowly but surely I am working on projects and putting finishing touches in rooms in the house. It feels so good to banish the heaviness of winter and start celebrating the freshness of spring. 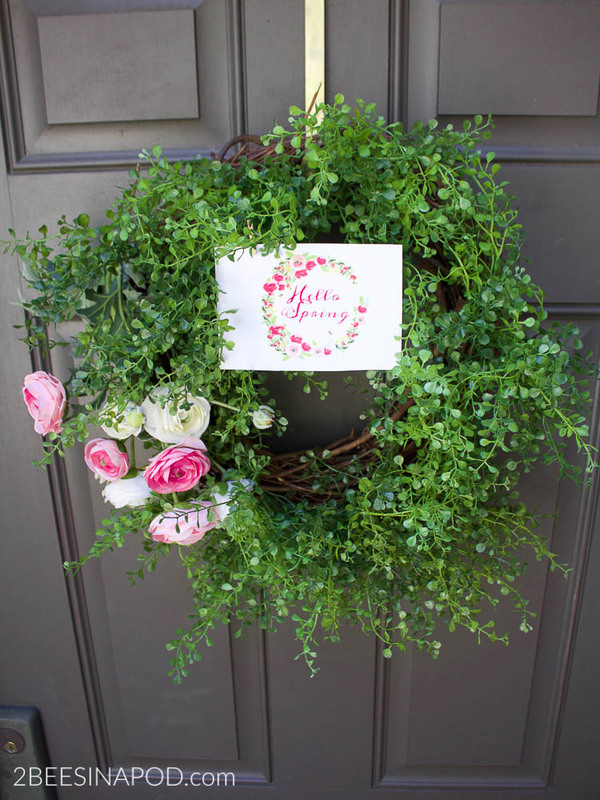 The first thing I like to do is add a pretty spring wreath to the front door. I saw a beautiful wreath in an online catalog and quickly had sticker shock. The price tag was $189.00! As much as I loved this wreath there was no way I was paying the hefty price. I set out to my local craft store to try and replicate the gorgeous spring ranunculus wreath from the catalog. Luckily for me the floral department at the craft store was having a 50% off sale. After purchasing everything I needed for my ranunculus wreath the grand total was just $12.00! 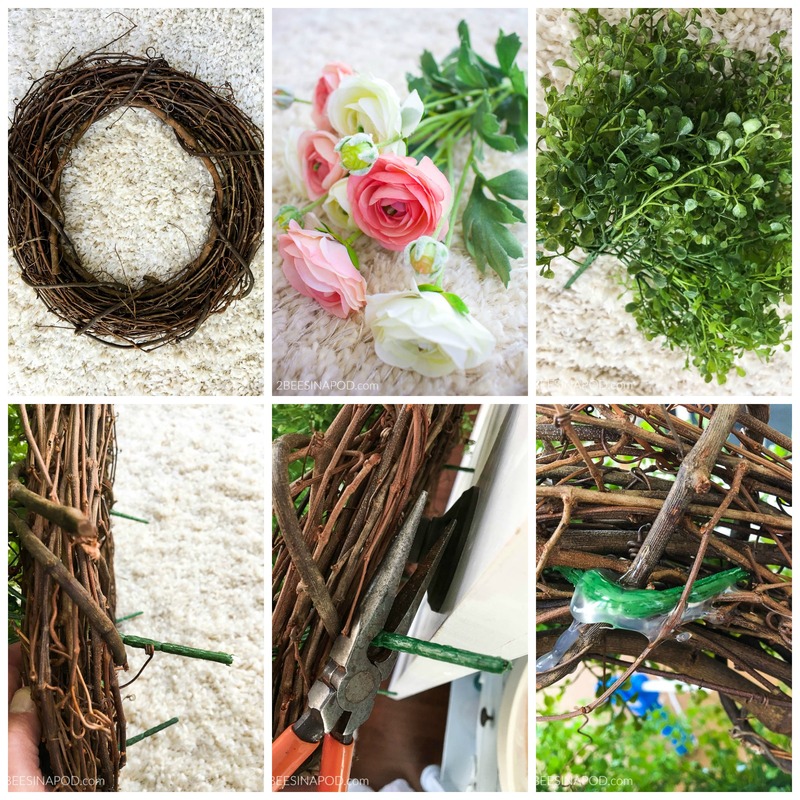 Use wire cutters to carefully cut off excess stems. Again, using wire cutters bend the stem over onto the back of the wreath. Glue the stem down with hot glue. 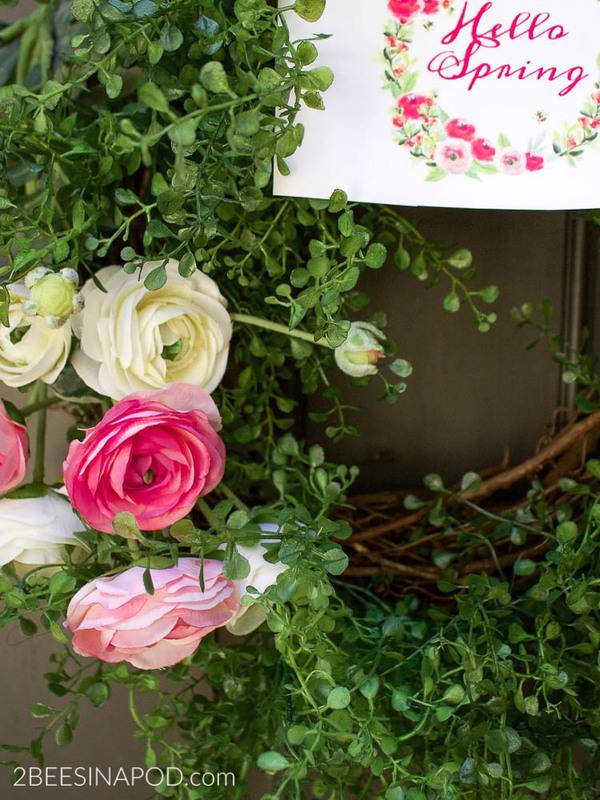 Gather the pink and white ranunculus sprays and trim the stems with the wire cutter. Rubberband the two sprays together and glue them down onto the wreath. You can add a little message of spring, but it is not necessary. These ranunculus look so authentic. The vining greenery is so pretty too. I created a free 8x 10 inch printable with pink ranunculus and a “Hello Spring” greeting. Just click on the link below or on the photo. The printable looks best when printed on cardstock paper. Enjoy! Wow! I love this wreath! I can’t wait to try It! Thanks so much for such clear, detailed instructions. I believe even I can do this! Thanks so very much Debra! 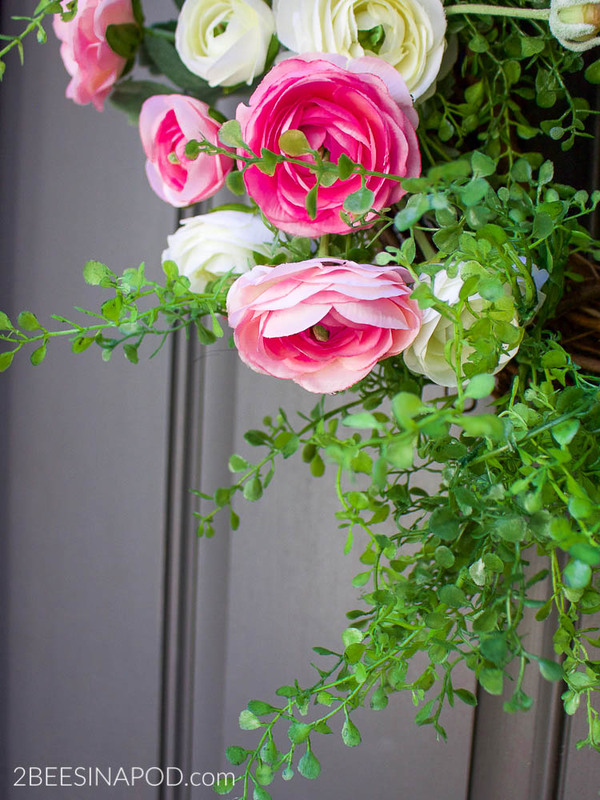 We love a pretty front door greeting and easy projects! We are positive that you can make this easy-to-do wreath! Good luck! Admittedly we are a bit envious of all of the postings we see of the fresh ranunculus that people get from Trader Joe’s. Sadly, we don’t have that option. We felt that these craft flowers looked like the real deal. Can’t wait to see what you create with the ones you purchased! Hugs and love. Such a pretty printable and I love that wreath. Thanks for sharing with us; Pinned. 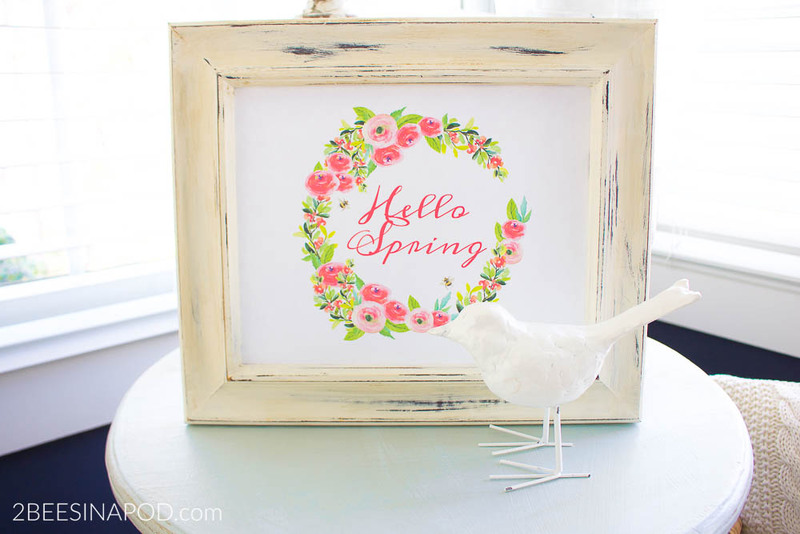 A gorgeous wreath and I love your pretty spring printable too. Thanks for sharing at Welcome Spring Link Party.